US Attorneys in Chicago just filed a superseding indictment against ex-hobby king Bill Mastro. 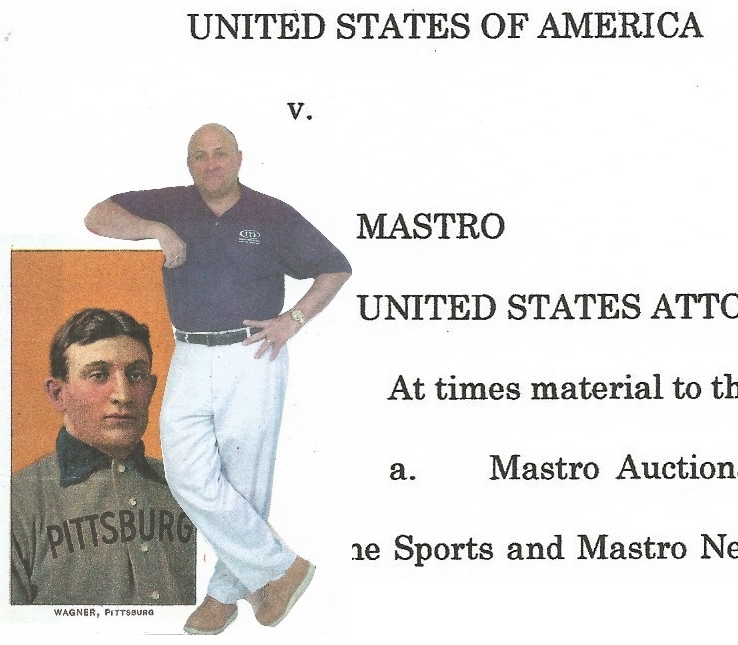 (UPDATED) When he was indicted in July of 2012, Hauls of Shame reported that hobby kingpin Bill Mastro was caught on a Federal wiretap admitting he had trimmed and altered the now infamous T-206 Honus Wagner card. Today, in Federal court in Chicago, that wiretap was confirmed as Mastro plead guilty to one count of mail fraud and trimming the Wagner. A Federal indictment described as superseding the previously-filed indictments against Bill Mastro and former Mastro employees Doug Allen and Mark Theotikos, was filed earlier this week in the United States District Court, Northern District of Illinois, by Assistant United States Attorneys Nancy DePodesta and Steven Dollear. Mastro appeared in Federal court for his change of plea hearing and according to reports out of Chicago earlier today has plead guilty to the one count of mail fraud linked to shill-bidding in his auction sales. In admitting he trimmed the infamous T-206 Honus Wagner card Mastro has further tainted the hobby’s most prominent relic now owned by Arizona Diamondbacks owner Ken Kendrick. The charges listed in the superseding indictment are identical to those found in original indictment filed in July of 2012, however, the new indictment does not include the names of Doug Allen, Mark Theotikos and William Boehm in the caption which now lists only Bill Mastro individually. Also missing from the new superseding indictment are numerous Grand Jury counts included at the end of the original papers charging Allen, Theotikos and Boehm with various instances of wrongdoing. DePodesta and Dollear also filed a “Felony Designation Sheet for Criminal Proceedings” which was approved by Judge Ronald Guzman and Magistrate Judge Gilbert. The US Attorney’s office in Chicago released Mastro’s 30-page plea agreement which states that the Feds want Mastro to serve between 57 and 60 months in prison. Part of the plea deal, unlike previous ones in front of the court, also has Mastro agreeing to cooperate with the government as its probe of the memorabilia and auction industry continues. Sources indicate that the government’s biggest target could be authentication giant Professional Sports Authenticator (PSA), the company that graded the Wagner card for Bruce McNall and Wayne Gretzky after they purchased it at Sotheby’s in 1991. The Wagner was the first card ever graded by the company and its founder David Hall. Prosecutors with knowledge that Mastro had trimmed the Honus Wagner card he and partner Rob Lifson originally purchased in 1985 told Judge Guzman they could prove that Mastro altered the sides of the over-sized card with a “paper slicer.” What prosecutors discovered is what hobby-insiders have known for years–that the card was a fraud and was fraudulently sold by others like Mastro’s former MastroNet partner Lifson who also knew the card was trimmed when he sold it through Robert Edward Auctions to Brian Seigel in 2000 for over $1.2 million. Bill Mastro was the "King of Memorabilia" when he published this "Size Matters" add in SCD for his MastroNet behemoth. For more coverage on the Mastro saga check out Friday’s broadcast of Cardboard Connection Radio on @BlogTalkRadio. Bill Mastro responded to his guilty plea and letters written to Judge Guzman on Paul Lesko's CardBoardConnection.com column. is the one count of mail fraud directly related to the shill bidding? Wait a minute. “The Card” was cut? I bet The-Card-expert Michael O’Keeffe is all over this in the Daily News today, right? Of course he is. This would be worth reporting on. Hmm. Let’s check. Does this mean I get back some of the money that I paid for cards from Mastro’s auctions……wondering why prices were so high on some of them…….. Collecting graded cards is like being at the end of a ponzi scheme. so long suckers. It took a long time before the kool-aid drinkers abandoned ship on mastro and allen. How long before they jump ship on joe orlando and PSA? 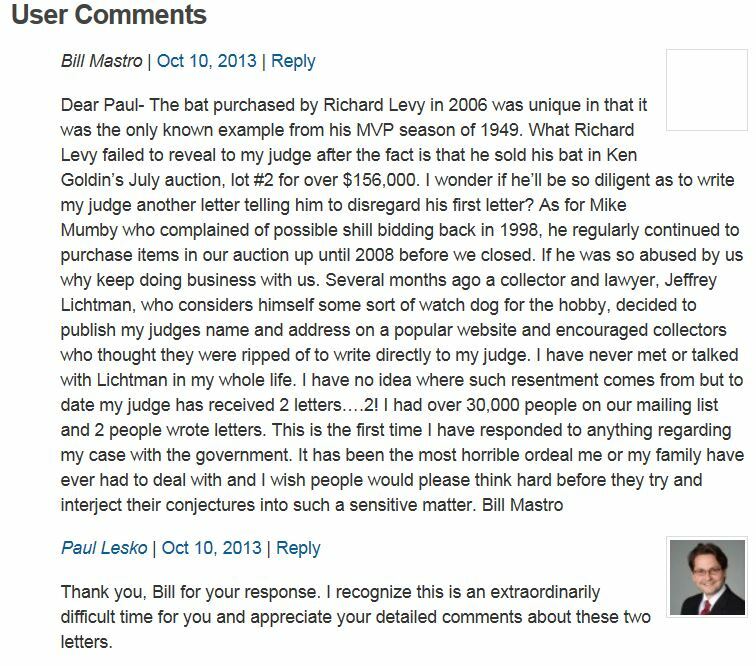 Notice how Mastro did not deny shill bidding those two buyers in his letter to Paul Lesko. He just tried to divert attention by talking about other facts. The fact that the bat seller made a profit does not mean the shilling was OK. He could have made a larger profit. To those of you that feel so horribly done by in bogus bidding wars, I have little or no sympathy. Unless of course your intention was to deposit said artifacts with the most relevant ‘Halls of Fame’. It is you that have created the market; Illicit traders will always emerge as naturally as the grass grows. This memorabilia should be shared by the nation and other visitors to your shores, don’t lock it away in a safe coveted for your own enjoyment. Can Nash or someone explain how the government figured this out …informant wiretap? donating items to many institutions like the hof and the smithsonian often results in the material sitting in the basement or the back room and never seeing the light of day like 90% plus of the stuff that goes there and rarely if ever makes it into the rotation. many collectors with great private collections like marshall fogel will give you a tour if you ask, and to people on the west coast, it is a lot closer trip to colorado than to cooperstown, new york. not saying that donating to these institutions is bad, but neither is private collections. Strange……. The quietness of Michael O” Keeffe on this story is speaking volumes to me…….keep up the good work Pete!!!! !